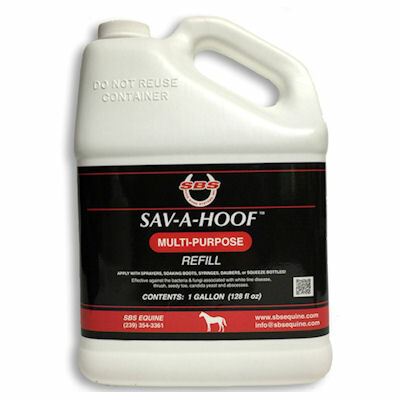 Sav-A-Hoof Multi-Purpose (SBS Equine) Gallon Refill (includes Free Shipping) offers a huge dollar savings, used it to refill empty bottles of Sav-A-Hoof Spray, Liquid, Flushing Tube and Dispenser, Thrush Stop and for Hoof Soaking Boots. Savings comparison: Sav-A-Hoof 7.5 ounce bottle sells for $17.95=$2.39/ounce. The Gallon Refill at $128.90 = $1.00/ounce.